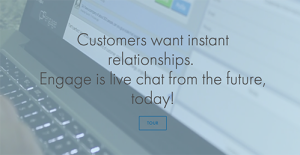 Engage is a live chat tool that helps your sales organization to accelerate pipeline, enhance the customer experience and improve visitor-to-lead conversion ratios. The platform helps visitors to your website to reach out, in real time, to your agents and employees in a personable way. The legacy live chat you see on websites hasn’t seen significant innovation in the last decade. The idea of being in a chat queue or speaking with someone you don’t know in a tiny chat box is outdated. Engage is designed as a new form of networking on the web. It enables organizations to put their customer-facing professionals on their website in an authentic way. Visitors and customers see pictures, names, and job titles, they do not have to wait in a chat queue, they get to choose who they speak with, and they can come back at any future point and start a chat again with the same person. Engage believes customers deserve to get a personal relationship, and the app helps like-minded companies to do that. What Problems Will Engage Solve? Scenario 1: You have people visiting your website, then leaving, and you didn’t find out why you didn’t convert them into a lead. With Engage, you can have more at-bats with prospective customers by being there to greet them instantly. Scenario 2: Your visitors are frustrated because all they want to do when visiting your website is to find a warm body to talk to. Unfortunately, your “contact us” page isn’t cutting it. Engage offers a directory of all your customer-facing people. You can surface that and give your visitors the human option. Scenario 3: Customers don’t like legacy chat where they are forced to talk with a person they know nothing about. This causes a lot of trust issues. Engage helps companies to support customers with information about who they are going to chat with before the chat begins. Digitally getting to know a person helps visitors and customers to quickly establish trust when they go into a conversation, comfortable with the fact the person they have chosen has the right job title and is truly empowered to help them with their issues or questions. Since each organization has unique business requirements, it is prudent for them to refrain from searching for a one-size-fits-all perfect software system. Needless to say, it would be useless to try to find such a system even among market-leading software platforms. The clever thing to do would be to catalog the various essential factors that need consideration such as main features, budget, skill levels of staff members, company size etc. Then, you should do your groundwork thoroughly. Read some Engage reviews and check out each of the other apps in your shortlist in detail. Such comprehensive research can make certain you weed out ill-fitting applications and select the system that presents all the aspects you require for business success. How Much Does Engage Cost? Engage is priced at $7/month per profile. There are no hidden fees or expensive start up costs. The vendor offers a 30-day free trial. We realize that when you make a decision to buy Customer Support Software it’s important not only to see how experts evaluate it in their reviews, but also to find out if the real people and companies that buy it are actually satisfied with the product. That’s why we’ve created our behavior-based Customer Satisfaction Algorithm™ that gathers customer reviews, comments and Engage reviews across a wide range of social media sites. The data is then presented in an easy to digest form showing how many people had positive and negative experience with Engage. With that information at hand you should be equipped to make an informed buying decision that you won’t regret. What are Engage pricing details? What integrations are available for Engage? Engage is friendly to CRM systems, and it is responsively designed to work across desktop, mobile and tablet. If you need more information about Engage or you simply have a question let us know what you need and we’ll forward your request directly to the vendor.